Cytoplasm refers to the fluid that fills the cell, which includes the cytosol along with filaments, proteins, ions and macromolecular structures as well as the organelles suspended in the cytosol. In eukaryotic cells, cytoplasm refers to the contents of the cell with the exception of the nucleus. Eukaryotes have elaborate mechanisms for maintaining a distinct nuclear compartment separate from the cytoplasm. Active transport is involved in the creation of these subcellular structures and for maintaining homeostasis with the cytoplasm. For prokaryotic cells, since they do not have a defined nuclear membrane, the cytoplasm also contains the cell’s primary genetic material. These cells are usually smaller in comparison to eukaryotes, and have a simpler internal organization of the cytoplasm. The cytoplasm is unusual because it is unlike any other fluid found in the physical world. Liquids that are studied to understand diffusion usually contain a few solutes in an aqueous environment. However, the cytoplasm is a complex and crowded system containing a wide range of particles – from ions and small molecules, to proteins as well as giant multi protein complexes and organelles. These constituents are moved across the cell depending on the requirements of the cell along an elaborate cytoskeleton with the help of specialized motor proteins. The movement of such large particles also changes the physical properties of the cytosol. The physical nature of the cytoplasm is variable. Sometimes, there is quick diffusion across the cell, making the cytoplasm resemble a colloidal solution. At other times, it appears to take on the properties of a gel-like or glass-like substance. It is said to have the properties of viscous as well as elastic materials – capable of deforming slowly under external force in addition to regaining its original shape with minimal loss of energy. Parts of the cytoplasm close to the plasma membrane are also ‘stiffer’ while the regions near the interior resemble free flowing liquids. These changes in the cytoplasm appear to be dependent on the metabolic processes within the cell and play an important role in carrying out specific functions and protecting the cell from stressors. 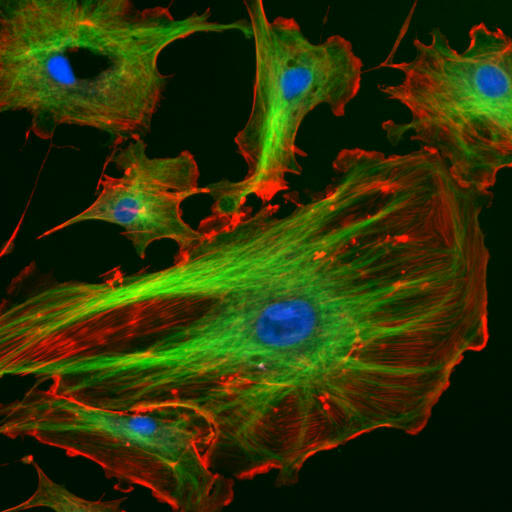 The basic shape of the cell is provided by its cytoskeleton formed primarily by three types of polymers – actin filaments, microtubules and intermediate filaments. Actin filaments or microfilaments are 7 nm in width and are made of double stranded polymers of F-actin. These filaments are associated with a number of other proteins that help in filament assembly and are also involved in anchoring them close to the plasma membrane. This cytoplasmic location helps the microfilaments become involved in rapid responses to signal molecules from the extracellular environment and produce cellular responses through signal transduction or chemotaxis. In addition, myosin, an ATP-based motor protein transmits cargo and vesicles along the microfilament and is also involved in muscle contraction. Microtubules are polymers of α and β tubulin, which form a hollow tube by the lateral association of 13 protofilaments. Each protofilament is a polymer of alternating α and β tubulin molecules. The inner diameter of a microtubule is 12 nm and its outer diameter is 24 nm. Microtubules radiate towards the periphery of the cell from microtubule organizing centers (MTOCs) located close to the nucleus, and provide structure and shape to the cell. This image shows the nucleus in blue, the actin filaments on the cell periphery are labeled red and the extensive microtubule network is marked green. The cytoplasm undergoes rapid reorganization during cell division with microtubules forming the spindle, which binds to chromosomes and segregates them into two daughter cells. 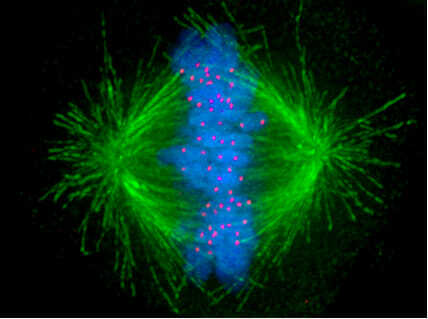 Similar to the previous image, chromosomes are stained blue and microtubules are green. Tiny red dots are kinetochores. Microtubules are involved in cytoplasmic transport, chromosome segregation and in forming structures such as cilia and flagella for cellular movement. Intermediate filaments are larger than microfilaments but smaller than microtubules and are formed by a group of proteins that share structural features. Though they are not involved in cell motility, they are important for cells to come together as tissues and to remain anchored to the extracellular matrix. Most eukaryotic cells have a number of organelles that provide compartments within the cytoplasm for specialized microenvironments. For instance, lysosomes contain a number of hydrolases in an acidic environment that is ideal for their enzymatic activity. These hydrolases are actively transported into the lysosome after being synthesized in the cytoplasm. Mitochondria, while containing their own genome, also need many enzymes synthesized in the cytosol, which are then selectively moved into the organelle. These organelles are placed in specific locations due to the physical gel-like nature of the cytoplasm and by anchoring to the cytoskeleton. In addition, the cytoplasm also plays host to multi-protein complexes like the proteasome and ribosomes. Ribosomes are large complexes of RNA and protein that are important for the translation of mRNA code into amino acid sequences of proteins. Proteasomes are giant molecular structures about 20,000 kilodaltons in mass and 15 nm in diameter. Proteasomes are important for targeted destruction of proteins that are no longer needed by the cell. Cytoplasmic inclusions can include a wide range of biochemicals – from small crystals of proteins, to pigments, carbohydrates and fats. All cells, especially in tissue like the adipose, contain droplets of lipids in their triglyceride form. These are used to create cellular membranes and are an excellent energy store. Lipids can generate twice as many ATP molecules per gram when compared to carbohydrates. However, the process of releasing this energy from triglycerides in intensive in oxygen consumption and therefore the cell also contains stores of glycogen as cytoplasmic inclusions. Glycogen inclusions are particularly important in cells like the skeletal and cardiac muscle cells where there can be a sudden increase in demand for glucose. Glycogen can be quickly broken down into individual molecules of glucose and used in cellular respiration before the cell can obtain more glucose reserves from the body. Crystals are another type of cytoplasmic inclusion found in many cells, and have special function in cells of the inner ear (maintaining balance). Presence of crystals in cells of the testis appears to be linked with morbidity and infertility. Finally, the cytoplasm also contains pigments such as melanin, which lead to the pigmented cells of the skin. These pigments protect the cell and internal body structures from the deleterious effects of ultraviolet radiation. Pigments are also prominent in the cells of the iris that surround the pupil of the eye. Each of these components affects the functioning of the cytoplasm in different ways, making it a dynamic region that plays a role in, and is influenced by the cell’s overall metabolic activity. The cytoplasm is the site for most of the enzymatic reactions and metabolic activity of the cell. Cellular respiration begins in the cytoplasm with anaerobic respiration or glycolysis. This reaction provides the intermediates that are used by the mitochondria to generate ATP. In addition, the translation of mRNA into proteins on ribosomes also occurs mostly in the cytoplasm. Some of it happens on free ribosomes suspended in the cytosol while the rest happens on ribosomes anchored on the endoplasmic reticulum. The cytoplasm also contains the monomers that go on to generate the cytoskeleton. The cytoskeleton, in addition to being important for the normal activities of the cell is crucial for cells that have a specialized shape. For instance, neurons with their long axons need the presence of intermediate filaments, microtubules, and actin filaments in order to provide a rigid framework for the action potential to be transmitted to the next cell. Additionally, some epithelial cells contain small cilia or flagella to move the cell or remove foreign particles through coordinated activity of cytoplasmic extrusions formed through the cytoskeleton. The cytoplasm also plays a role in creating order within the cell with specific locations for different organelles. For instance, the nucleus is usually seen towards the center of the cell, with a centrosome nearby. The extensive endoplasmic reticulum and Golgi network are also placed in relation to the nucleus, with the vesicles radiating out towards the plasma membrane. Movement within the cytoplasm also occurs in bulk, through the directed movement of cytosol around the nucleus or vacuole. This is particularly important in large single celled organisms such as some species of green algae, which can be nearly 10 cm in length. Cytoplasmic streaming is also important for positioning chloroplasts close to the plasma membrane to optimize photosynthesis and for distributing nutrients through the entire cell. In some cells, such as mouse oocytes, cytoplasmic streaming is expected to have a role in the formation of cellular sub-compartments and in organelle positioning as well. The cytoplasm plays hosts to two organelles that contain their own genomes – the chloroplast and mitochondria. These organelles are inherited directly from the mother through the oocyte and therefore constitute genes that are inherited outside the nucleus. These organelles replicate independent of the nucleus and respond to the needs of the cell. Cytoplasmic or extranuclear inheritance, therefore, forms an unbroken genetic line that has not undergone mixing or recombination with the male parent. Chemotaxis – Movement of a cell in response to a chemical signal. Intermediate Filaments – Cytoskeletal components formed by a family of proteins sharing structural and functional features larger than actin fibers and smaller than microtubules. Kinesin – A group of motor proteins that can travel along a microtubule and are important for the movement of cellular components, especially during cell division. Syncytium – A multinucleated cell formed by the fusion of the plasma membrane of multiple cells. Syncytia can also be formed through the interconnections between cells containing specialized gap junctions, allowing the cells to behave synchronously as a single unit. 1. Which of these biomolecules are NOT present as cytoplasmic inclusions? C is correct. Cytoplasmic inclusions can have crystals of inorganic compounds or proteins. They can contain carbohydrates such as glycogen and triglycerides and other lipids. However, nucleic acids have not yet been reported in cytoplasmic inclusions. 2. What are microtubules made of? C is correct. G- and F-actin contribute towards the formation of the actin cytoskeleton, while dynein and kinesin are motor proteins that traverse the length of microtubules. 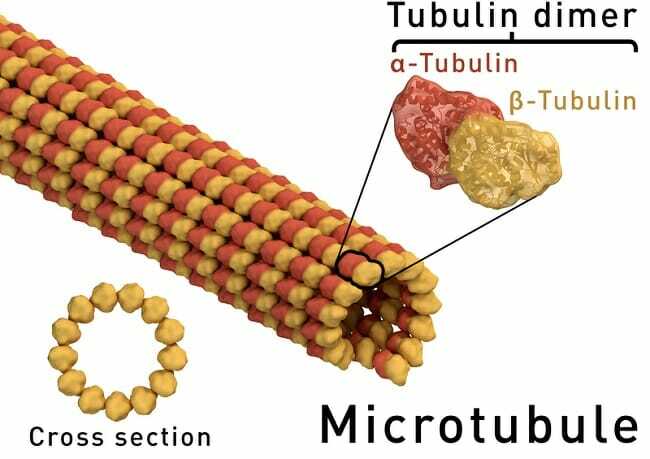 However, microtubules are large tubular structures are formed by 13 protofilaments made of alternating α and β tubulin monomers. 3. Which of these statements is true about nucleic acids in the cytoplasm? A is correct. Nucleic acids include RNA in addition to DNA and therefore every cell contains nucleic acids in its cytoplasm. Many proteins required for the cell to function normally are synthesized by translating RNA molecules in the cytoplasm. Mitochondria and chloroplasts are special because they contain their own genomic DNA, however, even red blood cells that have lost all their organelles contain RNA and continue to produce proteins in their cytoplasm.